When Alfie’s friends move away, he feels very sad and alone. Playing with the animals isn’t quite the same and the other children are all much bigger than he is. When Alfie sees a shooting star, he knows what to do. He wishes for a fun new friend, and goes to sleep waiting for the friend to arrive. When he wakes the next morning, he hears a rustling in the grass. Has his wish been answered? 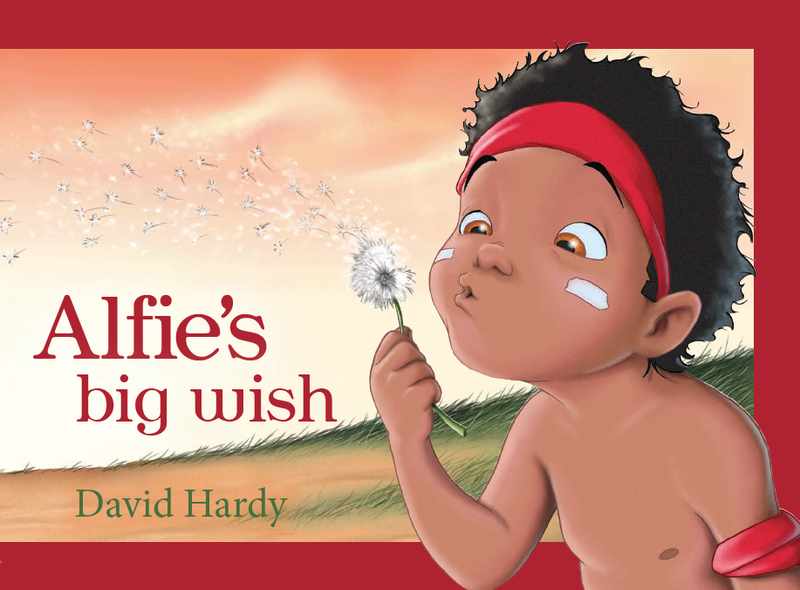 The second book in the Alfie series by author/illustrator David Hardy, Alfie’s Big Wish focuses on a familiar childhood concern. Even though there are other children around and Alfie’s mother is there to comfort him, Alfie feels left out and alone when his friends move away. The arrival of Myrna, a new girl and a new friend for Alfie, immediately restores Alfie’s good spirits. David Hardy presents this familiar scenario with a slightly unfamiliar twist, filling the story with indigenous characters in an outback setting. With the subject of diversity in children’s books a hot topic at the moment, Alfie’s Big Wish is another great example of how a book can offer young readers a slightly different perspective through the illustrations while the text focuses on a universal theme. The text has a pleasing rhythm and rhyme, making Alfie’s Big Wish an enjoyable story to read aloud, while the illustrations offer polished, appealing characters that reflect David’s extensive experience with animation. There are teachers' notes available for this book and you can read our review of the first book in the series, Alfie’s Search for Destiny, here.